Chubac Albert, born December 29, 1925 in Geneva and died May 4, 2008 in Tourrette; was a Swiss painter and sculptor. He holds a decorative art degree obtained in 1945 in Geneva. His work started with figuration before turning towards abstraction. He was an important figure of the School of Nice. Chubac Albert was born Dec. 29, 1925 in Geneva to trader parents. Until 1938, he traveled to Switzerland and to Annecy, France where his family owns a house. He attended primary and secondary school in Geneva. His mother died in 1938, followed a few months later by his father. He was then raised by his maternal grandmother and his godfather, an aristocrat who became his guardian. In 1942, he studied at the Arts Décoratifs in Geneva. It is also in an art school in Veyrier-du-Lac, near Annecy. He graduated decorative arts in 1945 and entered the École des Beaux-Arts in Geneva. He received a scholarship to continue his studies. A graduate of Fine Arts in 1947, Albert Chubac received three scholarships that allowed him to travel. He joined childhood friends in Laghouat in Algeria. He made many trips as well to Ouargia Ghardaia in Algiers. He finished his journey and realized his figurative paintings on paper. In 1948, after a visit to Geneva and Paris, he traveled to Spain and met the ceramist Josep Llorens i Artigas in Barcelona. 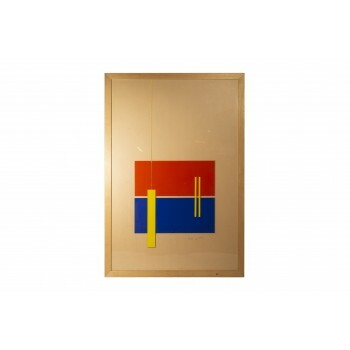 Back to Paris, he discovered, thanks to the writer and art critic Pierre Courthion, abstract art, through the works of Nicolas de Stael, whom he met in 1949. This will have a major influence on his work so far inspired by Georges Braque, Joan Miro, Henri Matisse, Fernand Leger and especially Pierre Bonnard5. After Algeria and Spain, other trips around the Mediterranean determine among Chubac all his work come (color palette, pictorial references) He is living in Italy and then spent eight months in a workshop artist in Greece, Mykonos. It starts the execution of large flat areas on thick paper gray-beige and small spots watercolors series. In 1950, the Greek writer Spiteris, appreciating the work of Chubac that portrays the daily life of the Greek people, organized an exhibition in Athens at Zappion museum. The same year, Chubac decides to leave Greece and left for Cairo. It shares the everyday life of Egyptians in the company of a Jesuit priest who travels the villages on the Nile until Upper Egypt. His work will therefore be strongly influenced by ancient Egypt and its large flat colors. 1952 marks his return to Switzerland, Geneva and Paris. During a visit to the south of France, he set up his studio in a small house near the village of Aspremont few kilometers from Nice and decided to come every summer. During this period, his painting is abstract, strongly influenced by painters Nicolas de Stael, Hans Hartung and George Mathieu. He then tries to gestural painting with cluster bombs. He spent 1954 to 1955 in London and then moved to Chelsea. Its good relations with Sir Alexander Fleming, the biologist, he met a few months before his death, allow it to sell small collages "informal". In short a stay on the French Riviera, he met painters Raysse and Claude Gilli. In 1958, the works of Chubac move away from a certain neoclassicism to be closer to the spirit of the New Realism. It performs wire sculptures of iron and tin cans, as well as all kinds of recycled materials. Ben (Benjamin Vautier), which has just opened its first store in October / gallery in Nice, the "Laboratory" 32, invited to participate in the exhibition "Scurvy" with Claude Gilli and Raysse. Never belonging to a particular group, Albert Chubac followed the movement of the School of Nice and took part in numerous exhibitions. In 1960 Chubac decided to settle permanently in Aspremont. That same year, he met an American merchant, Hubert Meyer, who loves her job and decides to exhibit in New York. 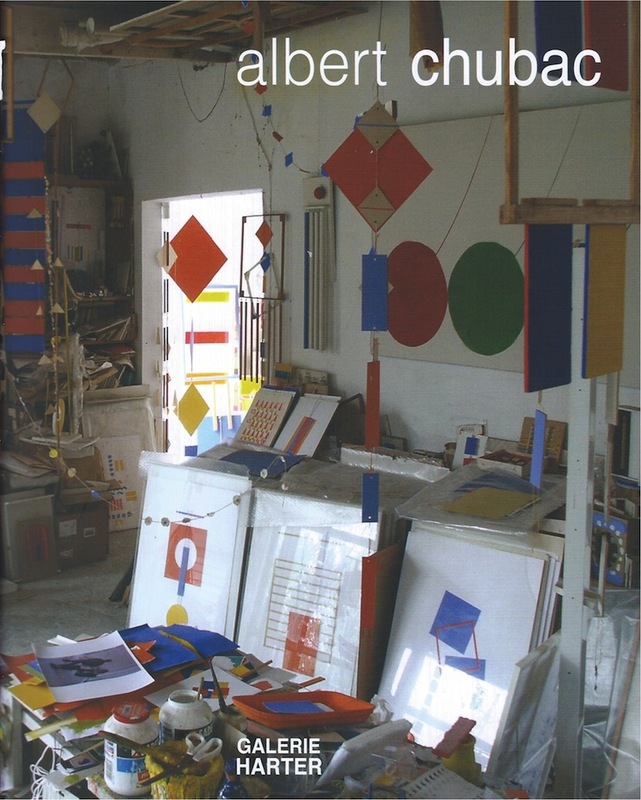 Albert Chubac was the first artist of the School of Nice to be exposed in the United States. He participated in the exhibition "Impact" in Ceret as well as exhibitions in Nice, Lyon and Paris. 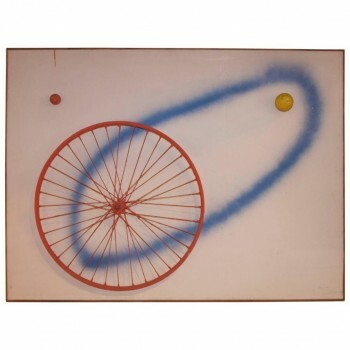 In 1963, he created a series of paintings including bicycle wheels then abandoning the canvas, dedicated his work to the realization of modifiable structures, moving in space. 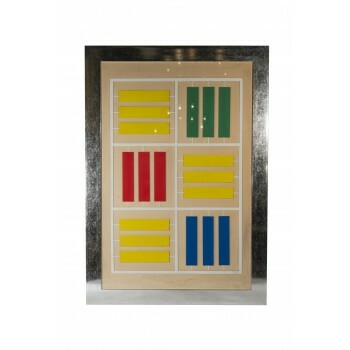 Shapes and colors come alive through materials as diverse as wood, cardboard, and later plexiglass. It preferably used wood for the "sculptures" and paperboard and tricks for the many "collages" in relief, always maintaining the predominance of its pure colors. 2008: Albert Chubac died on May 4 at the age of 88 years in the nursing home "The Wisteria" Tourrette. 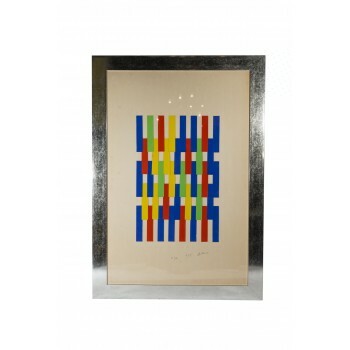 Albert Chubac, Geometric collage, signed and numbered 3/8, framed, circa 1980, France. Measures: Height 127 cm, width 87 cm, depth 3 cm. 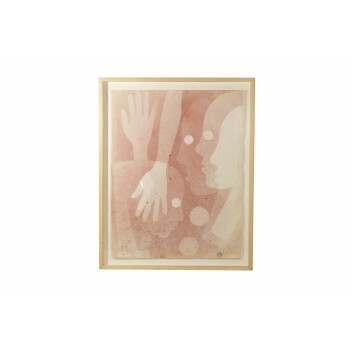 Albert Chubac, Transparency, Airbrush painting, signed. Circa 1960, France. Measures: Height 74 cm, width 59 cm, depth 3 cm. 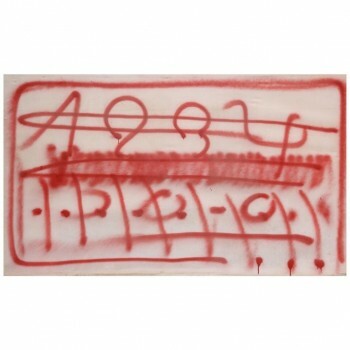 Albert Chubac, painting, signed, circa 1980, France. Measures: Height 135 cm, width 95 cm, depth 3 cm. Albert Chubac, painting on canvas, airbrush, iron and wood, signed and dated 1964 in the right corner, France. Measures: Height 97 cm, width 130 cm, depth 3 cm. 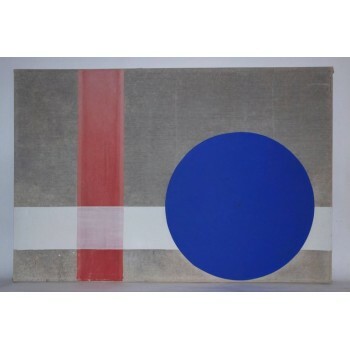 Albert Chubac (1925-2008), painting, paint on canvas and collage, circa 1960, France. Measures: Height 131 cm, width 194 cm, depth 3 cm. 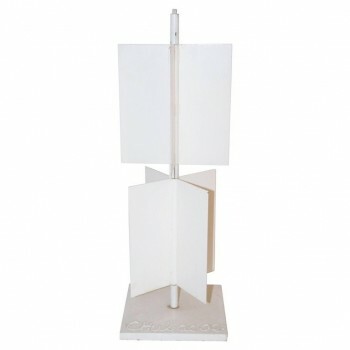 Albert Chubac (1925-2008), sculpture, lacquered whit iron, signed and numeroted 02, circa 1980, France. Measures: Height 60 cm, width 20 cm, depth 20 cm. 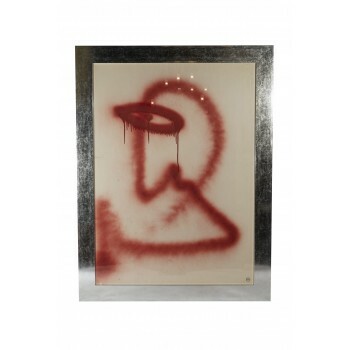 Albert Chubac (1925-2008), painting, aerosol on canvas, signed and dated, circa 1962, France. Measures: Height 149 cm, width 252 cm depth 3 cm.